Dave O'Grady earned a degree in history and was a librarian at the David Rice Library at the University of Southern Indiana. World War II had been going on for three and half years. The United States was in the middle of the battle of Okinawa in the Pacific. The war in Europe was almost over. The headlines in the Evansville papers on June 12, 1945 read something like Eight Arrested as Mayor Carries Out Threat to Raid Bingo Game. There was a bingo riot on June 11, 1945 in Evansville, Indiana. Why? A meeting between the Young Democrats and the Mayor of Evansville, Manson Reichert took place on June 7, 1945. The Young Democrats wanted to hold a bingo game. There was a law that made gambling illegal. Section 10 of the Indiana State Criminal Code outlawed gambling. The mayor had previously relaxed the law allowing a number of groups to hold bingo games. The mayor believed any political party function should not include gambling. The Young Democrats did not believe that bingo was gambling. The Young Democrats wrote a letter requesting permission to hold a bingo game in the former Union Club on the second floor of 6 North Second Street on Monday, June 11, 1945 at 8:00 pm. They believed that since other clubs such as fraternal, social, labor and patriot were allowed to have bingo games under Mayor Reichert; that they should be able to hold a bingo game too. The mayor refused to lift the ban. The Young Democrats had their trustees write a letter to the mayor. They attacked the mayor personally and politically. Comments such as? your family made their fortune through Democratic City administrators? and you voted more times Democrat than republican are a couple of examples of how they attacked the Mayor's character. The mayor continued to stand his ground and refused to give in to the bingo game. The mayor made comments such as I will have the whole police force there to stop the game on Monday. The Young Democrats wanted to raise money. They stated that they gave money every month to charitable groups and wanted to continue to give donations. The mayor ordered that everyone who attends--players and spectators will be arrested. A number of things have come to light since the meeting on Thursday. Mayor Reichert issued orders to Police Chief Freer to arrest everyone on the premises if a bingo game was in progress. The mayor also told Chief Freer to smash all the bingo equipment. The Young Democrats placed an ad in newspapers advertising the bingo game. The Evansville Ministers' Association announced an antigambling campaign will start on Sunday morning from the pulpits. The Young Democrats set up for the bingo game on Monday, June 11, 1945. Tables and chairs were set in place. The Democratic county chairman urged the Young Democrats not violate the gambling laws; insisting that there was a legal way to hold a bingo game. The Young Democrats would not back down. Mayor Reichert held a meeting with Prosecutor Emanuel Baugh and City Attorney Ben Zieg to discuss plans to prosecute everyone that attended. Wow, what took place Monday night was crazy. 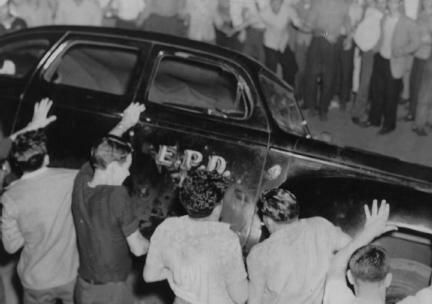 The Evansville papers stated that 10,000 people watched the riot take place. Two police cars were turned over. Eight people were arrested including four trustees of the Young Democrats. Four more people were arrested on Tuesday including a thirteen year old boy who was jumping up and down on the police cars. The boy admitted that he was involved in it and was sent to Juvenile Court. This riot led to the resignation of the police chief, Harry Freer. Freer would not discuss what took place between him and the mayor, but, he did say that his resignation was attributed to the way things were handle during the bingo game. The mayor was very unhappy with the way things were handled by the police force. 10,000 people against a couple of police officers. How could they handle it? Why would people go that crazy over a bingo game? On June 12th around 600 people played in a bingo game at the Evansville Athletic Club. There was no protest or did the police raid the game. Why would that happen? The Evansville bingo riot happened because the political lines were drawn and could not be broken. The republican mayor and the Young Democrats each wanted what was right. The mayor was against gambling at a political event. The Young Democrats wanted to raise money. Is there anyone to blame? Probably not.